I scooped up all your assets in the last sale. Beautiful work. Question - would you happen to have any UI elements (or know of any) that fit your art style? I'm attempting to use your PixelMobs and RageTile packs to produce a game, but it's lacking a properly styled UI. Very cool. Thank you, sir. I purchased all of your sprites awhile ago; I love them. Love these. Really nice work. A friend of mine is using your tiles for a game. Until I saw screens from it I had no idea that these tiles looked so nice. I don't think your previews are showing them off to their fullest. You might want to have a few previews that are easier to see the tiles in, maybe jpged if you're worried about people just taking them. awesome! can you ask them to share their project with me? (the pixel artist) benmhenry@gmail.com thanks and glad you like em! Oh, dear. That would be me! I'll happily share the project once it's finished. 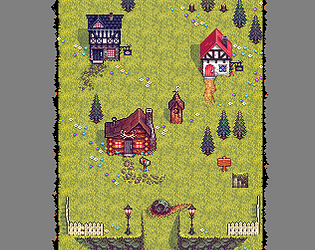 It's just a small, basic thing in RPG Maker to show people that a game doesn't need to have 1000+ maps to be decent, or even playable, so I'm making the entire game in a single map. I'm finding these tiles to be quite versatile, with pretty minimal modifications, and I'm using Open Game Art characters. Added code to load the PixelLevel town.